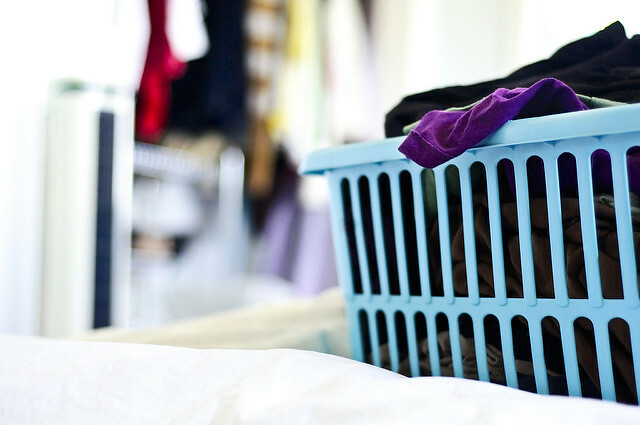 If your cat’s life appears to be to complicated, here are 7 life hacks to simplify it. 1. 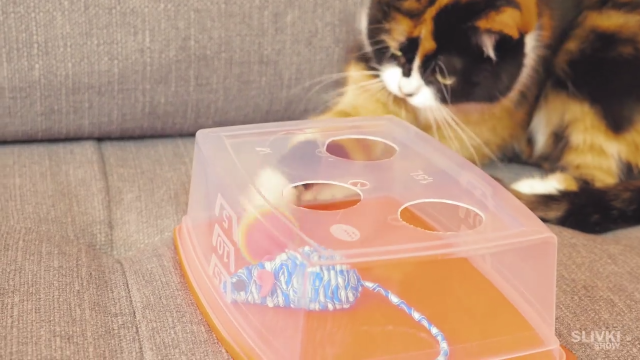 When your cat is getting bored, take such a plastic container, put a round object onto it, trace around it and make a few holes in the container with a utility knife, drop a few of your cat’s favourite toys inside the container and that is it. Now instead of cat scratching your furniture your cat will be entertained with an interesting activity. 2. Often times we like to enjoy looking through a window and your cat liked it too. 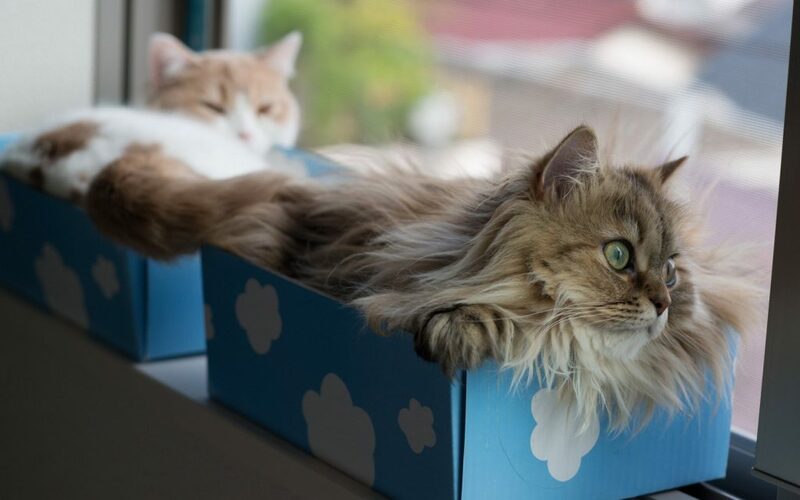 Take a cardboard box with short side panels and put it where your cat likes to stay most. It is not that difficult to do and now your cat will feel way more comfortable and will enjoy basking in the sun more. 3. Another cool life hacks. Cats love lying on sofas and they will certainly leave some of their hair on sofas unless they are hairless. Just take any rubber glove, put it on and rub your hand over a furry surface of your sofa. 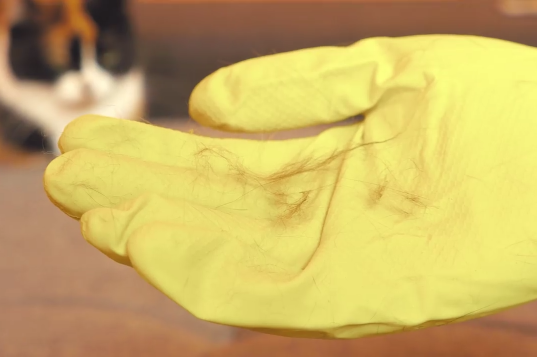 You will easily collects the hairs into a hairball easy to remove. 4. Now take an old T-shirt and two wire hangers. Straighten out the wire hangers into straight even wires with a pair of pliers Bend the wire at 90 degrees angle 10 centimeters away from the ends of the wire and bend the tips of the wire like this. Now take a cardboard sheet with roughly 35 centimeter long sides. Place the wire onto the cardboard sheet. Make holes in the cardboard sheet with the tips of the wires and bend the tips of the wires on the other side. You are supposed to end up having such a structure. Let us fix the wires with a scotch tape and slide the T-shirt onto this nest like structure. Let us fold down the sleeves and fix them in place with safety pins. We’ve made an awesome cat tent. 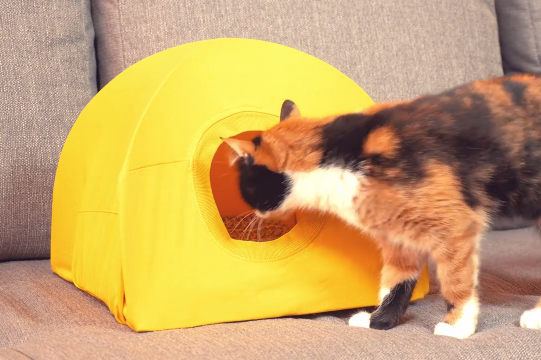 Here your cat will be able to wait out a bad weather or to hide from you. 5. Take a small cardboard box. Cut off the flaps and draw a few circles on the cardboard in any order and cut them out. Now take a small toy and a short stick or wire. 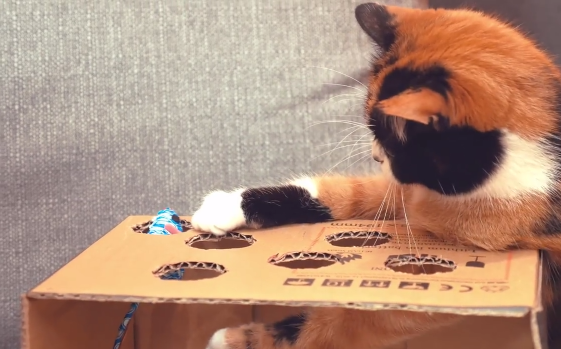 Stick the toy and now you can start playing with your cat, pushing the toy through the holes. Your cat is having fun and you don’t feel bored as well. 6. There are lots of places where you’d better not let cats play because they can make a mess there. Take a scotch tape and attach it to the table with the sticky side facing up. Cats really don’t like when something sticks to their paws and your cat won’t ever go there again. 7. If you decided to bathe your cat, most probably it won’t like this idea. Yet, if you put an old towel on the bottom of the bath, the situation will change drastically. Its paws won’t be slipping and it will feel more confident and it won’t panic any more. In the end make sure to dry the cat thoroughly and in order for it to feel cold and of course not to catch cold. Next article Top 15 Fascinating Cutest Baby Animals of All Time.